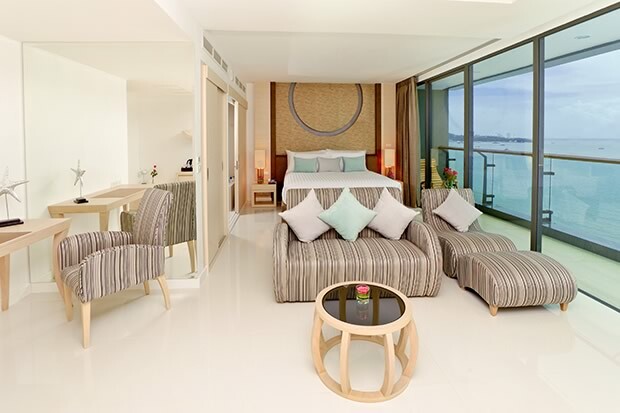 This 5-star resort attracts both Thai and international tourists, offering an experience that subtly brings out the best of the East and the West in a tranquil spot immersed in busy Pattaya. After a long week of work, wearing acupressure slippers that massaged my pressure points as I walked into the therapy room at Cape Dara’s Luminous Spa, already seemed like a great way to start my weekend. I would normally go for a traditional Thai-style massage, but this time I decided to try something new: “Meet halfway: a combination of Asian and Western techniques to create a deep sense of relaxation.” My 60 minutes of stress relief therapy began with firm pressure, followed by a deep tissue treatment with Thai aromatic oils. An interesting combination of very different massage styles, merged to perfection to achieve the ultimate goal of my short holiday: relaxing. I was going to be in Pattaya for two days, and I wanted to make efficient use of my time there in order to visit Mimosa, the open-air market, to go and try the banana boat at the island across the cape, Koh Larn, and also spend time on the beach doing nothing at all. It had been a good first day so far. And it got even better when, while immersed in a sumptuous bubble bath in my Dara suite, I was suddenly compelled to open my eyes as I felt a warm light on my face. And there it was: a huge orange sun that had appeared from between the clouds, reflecting a golden light through the bubbles the sparkling wine in my hand. The next activity of my busy agenda was even a more promising one: trying Radius, the hotel’s fusion restaurant located right by the beach. Thai food is one of my favorites, but sometimes I need to go back to my farang flavors. Hence, I thought that night I’d start with a Dara seafood platter and an all-time classic Caesar salad. And wow, I got Isaan-style grilled chicken on my lettuce, and the flavors of lemongrass and kaffir lime leaves next to the Norwegian salmon and scallops, all adding nicely to a smooth transition from fresh to hot, from salty to sweet. The cherry on top was the rack of lamb, which fulfilled entirely my wish to taste some European flavors. Everything was going well, except for the fact that it didn’t look like I was going to be riding the banana boat or going shopping, when the hotel was keeping me busy so many wonderful treats. So I decided to just stay and enjoy the private beach and its two swimming pools—one of which I took a dip in at night, with a view of Pattaya’s city lights. I wondered about the name and found out that “dara” means “star” in Thai. Hence, all the architecture and the interior design of the resort revolve around the theme of a cape that is close to the stars. This motif can definitely be seen in one of the ballroom’s massive chandeliers, which has a galactic feeling to it. Pattaya used to be a tranquil place where Thai families would go to spend a relaxing holiday. Today, the city is full of resorts, activities, and people. However, following the motto, “Once upon time is now, the yesteryear is found again here,” the owners communicate through the interior design their wish to make everybody feel relaxed when spending time there. This was attained by starting with a wide open lobby with a high ceiling that lets the sea breeze come in through it, and by keeping the resort a quiet place with a well-preserved private beach. 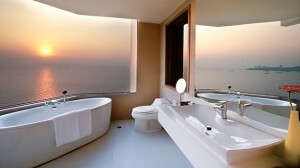 The sea view from of each of its 264 rooms adds to the tranquility. And when it comes to the service, their staff are also trained to make guests feel like in the old days again, welcoming them with warm smiles. While Cape Dara’s guests are 70 percent Thai (and the rest usually Russia, Korean, or American), the massage I received, the food I tasted, and the peace I experienced in such a busy city as Pattaya made it clear that Cape Dara is all about meeting halfway. Off to Bangkok I went with a smile on my face, knowing it is still possible to find tranquil spots close to the capital.